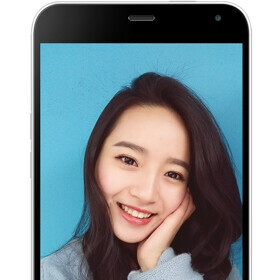 Meizu earlier this month announced the M1 Note, aka Blue Charm Note, a new 5.5-inch handset that offers an impressive list of features for only $160 (16 GB version). The handset is made mainly for the Chinese market, where competition is tougher than ever (Xiaomi’s meteoric rise has certainly forced older manufacturers to rethink their strategies). Even before its announcement, we suspected that the new Meizu smartphone would look a lot like Apple’s iPhone 5c, and we were right to do so. The M1 Note was recently caught in the wild, and photographed next to Apple’s plastic-made iPhone. As you can see below, Meizu copied even tiny details from the iPhone 5c, although, of course, there are also differences: the screen-to-body ratio is clearly in M1 Note’s favor, the rear cameras have different positions and aspects, and the iPhone 5c has a 3.5mm headset jack at the bottom (while the M1 Note features one on the top). Also worthy of mention is that Meizu’s smartphone comes in exactly the same colors that the iPhone 5c has: blue, green, pink, white, and yellow. Although, as we said above, the M1 Note is first and foremost targeted at the Chinese market, the handset is featured on Meizu’s international website. Does that mean it’s going to be sold in other countries at some point? We’re not sure yet, but we’ll definitely let you know when we find out. Yeah, it just gives you three times better specifications. With a bloated OS that needs it to run smoothly. Far from it. It runs very smoothly on 1 GB of RAM due to the strong optimization of iOS and the hardware while Android is almost the exact opposite. I use an LG G3 and iPhone myself depending on my mood and I must admit that with skins and extra useless added "benefits" of OEM modifications that slow the phone down I just want to throw the phone across the room. iOS = optimised very well for the few phones and tablets running it with similar hardware specs Android = optimised as best as possible for hundreds of different phones ranging from low end specced phones to high end specced phones. I dont know about best possible for hundreds of low end. Can it run on low end? Sure. But best possible is the WP, that thing make 512mb of ram feel like 1gb of ram. Just now was killing me that the S2 didnt have enough ram to run square app, without killing everything. How does the iPhone handle multitasking? It's not only about processor and RAM. It has better camera, better and bigger screen and so on. I've been using the Meizu MX4 Pro in the past couple of weeks and I can assure you it runs very smoothly. In fact, it's so surprisingly good in so many aspects that I am seriously thinking making this my daily driver. Check it out if you get a chance. I'm also very fascinated to see the M1 Note, Meizu is doing some ground breaking engineering - notice the amazingly slim bezel around the screen. A subtle improvement that makes a world of a difference. Victor, doesn't the MX4 Pro have a substantially higher price that rivals that of other flagships? (At least when I check their site). This I must ask, how are they doing anything "ground breaking" when compared to LG G3 or HTC. Their prices for the flagships are the same and their performance sounds like they are the same. The low end is what I'm most interested in with performance. And as much as I really like Android, I cannot support this company that literally looks like they took everything from Apple from their phone looks to their site to buy the phones that looks almost the same. Newbie ;) Hey Applesupport. I need to make a call. I can´t find my iCall app, Shall i buy some accessory??? Considering how much iPhones are selling worldwide, people don't care about empty specs. iphone 5c was released like in 2013. Your specs comparison is way off. How is it cloned? because it has a plastic back and blue colour? The curves aren't even the same radius, camera isn't in the same place either. iPh0ne arena are you that dumb and blind? I think they havent seen a Nokia..which apple copied. Dude, the buttons. The speakers holes. Screws by the charge port. Microphone hole. The glossy finish is just insult to injury. Yeah, there are a couple differences but this is way too similar to be coincidence. lel i said I would rather have, not that I would buy. I'm waiting for 2015 annoucements, my next phone will be a Galaxy S6, Xperia z4, LG G4, HTC M9.. something. If you don't know meaning of clone.